Well, it is Wednesday afternoon, and I am coming off of three days without a sub job. Needless to say I am feeling grumpy, angry, and a little unproductive. I think I mentioned that part of the reason I keep so busy is because without something to do, I turn into a lazy slob. I've already hit that point. So, I need some motivation to be productive for something, and the Belated Readathon this weekend hosted by Amanda at Dead White Guys is coming at the perfect time. The goal for the readathon is to read as much as possible on Saturday. It starts at 7am EST and goes until 7am on Sunday morning. (You can follow that link above to be taken to the sign-up post if you want in). It is a bit of a dismal day today. We woke up to rain, and it has been raining ever since. I usually enjoy these kinds of days, but I have had a lot going on this week, so I haven't spent much of the day lounging as I usually would. To be honest, since finishing school on Tuesday, I have been constantly on the go. My only downtime was last night when Matt got off work. Beyond those few hours, we've been traveling, eating, shopping, or visiting with family. It is nice to be home, but I am staring at a messy apartment that needs to be whipped back into shape sooner rather than later. Tomorrow morning it will be weird not to get ready for school and go into "my" classroom. For the first time in nearly a year, I don't have steady employment, and that is going to stare me in the face in the morning. I know I will adjust and the daily sub jobs will slowly roll in. Tomorrow, however, I plan to spend at home catching up on some things, getting some stuff organized around here (you know, the things I have shoved into closets), and some reading/writing. I haven't touched my Nano novel in nearly two weeks, and while I feel really confident in what I am writing, I don't think I want to rush through it to try and win by Wednesday at midnight. We'll see. I had grand plans for reading this weekend, but since I have been a little busier than normal, nothing was really accomplished. The only "book" I completed was Civil Disobedience, which shouldn't count since it was only 30 pages. Buy hey, that's progress, right? I still feel like I am in a rut, but I am going to power through the rest of my commitments for 2011. I have some "fun" things I have been meaning to read, so I think they will be my reward after finishing my commitment titles. The Portrait of a Lady by Henry James: I started this early in the month, right before I had to collect a bunch of essays and get everything in shape for my departure. I really LOVE it, but I need to set it aside while I finish my Group Reads for November and December. 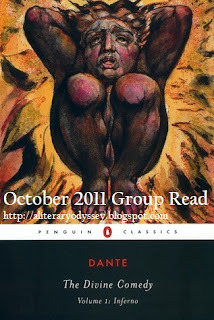 Purgatorio by Dante: I'm halfway through. And I was supposed to have this finished by last week. I am enjoying it, but I keep getting distracted. 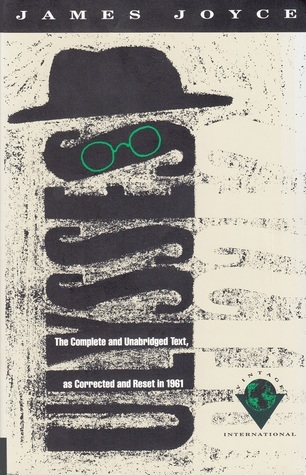 Heart of Darkness by Joseph Conrad: This is my fourth read and I hate it as much as I did the first 3. But I am going to get through it no matter what (I'm about 50 pages from the end). Walden by Henry David Thoreau: This is the second title I wanted to read for Transcendentalist Month, but I haven't started it and need to finish by the 15th. I actually really liked Civil Disobedience, so I am hoping this is similar. 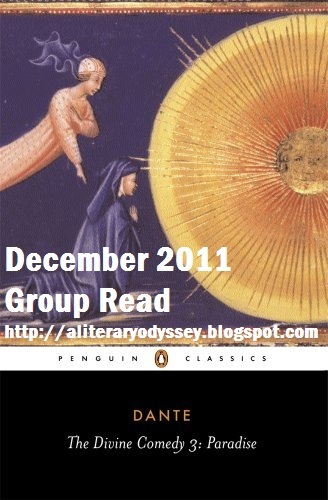 Paradiso by Dante: This is a December Group Read, so I have plenty of time to get to it. I'm looking forward to finishing the trilogy and finally marking The Divine Comedy off my list. Sense and Sensibility by Jane Austen: The other December Group Read. I am SUPER excited to get to this, since I haven't read it in ages and was just sent a beautiful new copy for review. The Inheritance Cycle by Christopher Paolini: I pre-ordered the fourth title over the summer, but it has been so long since reading these that I don't remember them all that well. I really want to read the whole series again, so this will be my reward after I finish the list above. Hahaha. Those titles make me laugh. I think it might be impossible for me to complete the challenge, but I am going to try. I am probably going to set aside Lord Jim and Pamela for next year. Mainly because my current go-around with Conrad makes me want to stab my eyes out, and I think I want to tackle Clarissa by Richardson before Pamela. I don't think I can do it. I mean, the Dickens title is over 800 pages. But, I am going to try. And at least I won't have to worry about picking out titles for the next month-I already have them set out! ;) We'll see how it goes. At least I know for next year not to procrastinate and to get some of these titles out of the way early on, rather than waiting until the end of the year. It is Saturday night, and I am just sitting here, so I thought that this would be fun. :) Enjoy! (I should note that I got this from Jillian, who got it elsewhere). 1. The books I’m currently reading: I am in the middle of a number of things, mainly because I have too many commitments and not enough time to read recently. I am in the middle of The Portrait of a Lady by Henry James, which I set aside for a bit to finish some other titles. I am also close to the end of both Purgatorio by Dante and Heart of Darkness by Joseph Conrad. 3. The next book I want to read: I’m going to be starting Walden and "Civil Disobedience" for Transcendentalist Month. I also need to get to Paradiso and Sense and Sensibility before the end of December. There are also a number of things I want to finish before the end of the year-including a read of all 4 of Paolini's Inheritance Cycle titles (I got the fourth one a few weeks ago-I forgot that I preordered it over the summer). And before anyone points it out, since I didn't spend my own money, I didn't break my book buying ban. So there. 5. 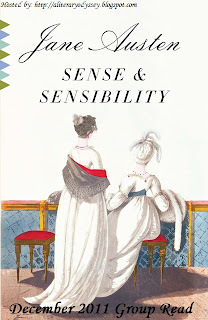 The last book I was given: I was sent a beautiful copy of Sense and Sensibility for review! I'll be reading it soon! 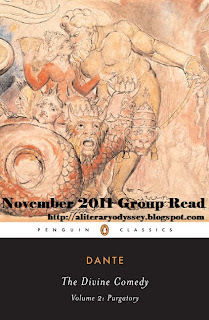 Welcome to the link-in post for the November Group Read of Dante's Purgatorio, the second volume in The Divine Comedy. Here is the link for thoughts and impressions on the first volume, Inferno. We will also be reading Paradiso in December-think about joining us (Here is where you can sign up). I will not be posting my own thoughts here (I will put them into their own post in a couple more days), but instead we will use this space to link to everyone's post. What you need to do is leave a comment with the link to your post on the book. I'll link it here, so that other participants can come and see what you had to say. Come back over the next week to see what everyone else had to say! 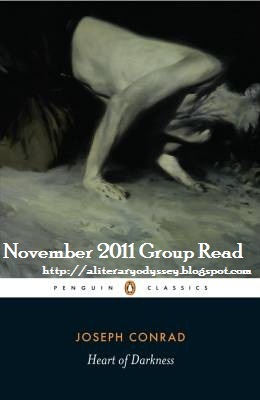 Welcome to the link-in post for the November Group Read of Joseph Conrad's Heart of Darkness! Most of us living in the United States are celebrating Thanksgiving today. And while some might that Thanksgiving is one of those "commercial" holidays, I love what it means for me. As a kid, I would love to help my mom set the table for Thanksgiving. For a few years, we actually spent the holiday "up north" (further north in Michigan) at my grandparents' cottage. Either way, I liked the idea of readying a big meal for everyone in the immediate family. In college, Thanksgiving meant coming home from school for a large weekend before the last two weeks of the semester. I always LOVED that weekend as a way to unwind and relax. But beyond all that, this time of year reminds me of family. I lost my paternal grandmother a few years ago the Monday before Thanksgiving. And instead of ignoring the holiday, my parents hosted the entire extended family at our house that day for food and fellowship. And while we all knew we would have to bury my grandmother the next day, we spent that day, that Thanksgiving, being thankful for the strength of our family. I always remember that when things get rough. I know I have much to be thankful for this year. While I could dwell on the negative, harp on the things that didn't happen, and whine, I won't. Why not? Because in the midst of the small amount of negativity I experienced this year, there were also a lot of positives. I say it often, but it doesn't hurt to say it again; this blog has saved me in many ways. It sounds silly, right? But really, having an outlet, a community, and an amazing support system has helped me get through some of those bitter disappointments the last two years. And I probably don't say it enough, but thank you. For everyone who has ever stopped in even for a moment, thank you. And a big thank you to all of you who comment, tweet, read, and offer virtual hugs. I think I am in a far better mental place for having jumped into this community. It is easy to take this for granted the other 364 days of the year, but today, well, I can acknowledge the huge things you have all done for me. 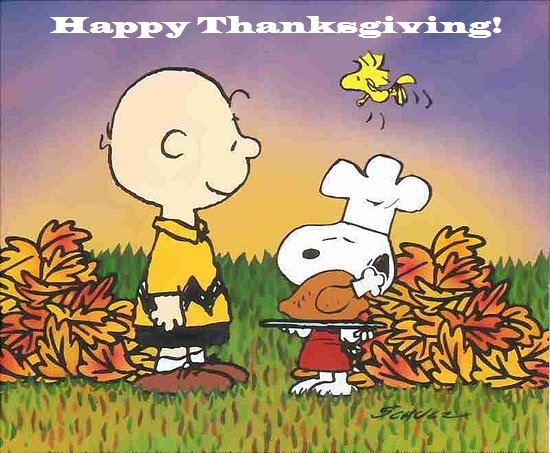 I wish you all a wonderful Thanksgiving, and for those of you who don't celebrate, or live outside the U.S., I hope you have a beautiful day. It is always a punch in the gut when a much-loved author passes away. This news, however, feels a big like a freight train ramming me over and over again. 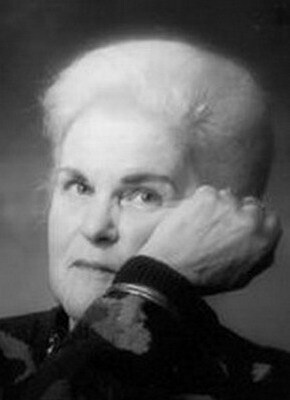 For those of you who haven't heard, Science-fiction/Fantasy author Anne McCaffrey passed away this week at the age of 85. she is best known for her Pern series, which I wrote a post on back in March 2010; you can read that post here. She was a pioneer in her genre, as many of the greats in Science-fiction and fantasy are men. She won awards for her novels, and continued her Pern series until just this past year. She was amazing. But more than anything, he introduced me to new literature and sparked an obsession with reading. Because while I was a reader before, I can truly say that reading her work opened doors. It broke down boundaries for what was "acceptable" to read. It has long been a goal to reread the entire series in order, but I have put it off for a number of years. Now, with her passing, I know I will have to take the time to revisit a world I haven't been to in awhile. If you want to read an article about her passing, I would suggest this one. I want to let you all know in advance that this may be a rambling post. There is a lot going on in my life right now, and I feel like filling you in on all of the details. Tuesday is my last day in my long-term sub placement. Starting next Monday, I will only be working as a daily sub. If I don't get a job for the day, I will be at home. This is going to be a huge transition, since it has been a long time for me since I haven't had steady work. Besides the obvious financial strains, this is going to be hard for me mentally. I have the tendency to be either an insane workaholic or a lazy bum. I am worried about not keeping busy. More than all of that, I am really sad to be leaving my kids. While the start of this year was a little unsteady, I have really hit my stride in the classroom. Of course, I always question what I have done as a teacher. I focus on the negative things that have happened; I worry that she will return to the room, talk to the kids, and realize that I didn't teach them enough. I know that sounds pretty silly, but I worry anyway. More than anything, the last year of constant teaching has shown me that I truly DO want to teach. I just need a venue. And students. We're also reaching the end of the calendar year and that has also put me into a reflective mood. I like to think about just what I have accomplished. And while I cannot add a permanent job to the list this year, I have done a lot to feel proud of. You can expect that as we near January 1, more of my thoughts on the past year will come out. I think I was lucky enough to read 10 pages of my current book (The Portrait of a Lady). I haven't touched Purgatorio or The Heart of Darkness. I fail. But, starting on Tuesday, I am making some strict goals to get through some things by the end of the weekend-basically those three titles. I know that it has been quiet over here since last weekend, but I ask that you be patient with me for a few more days. Once Tuesday is over with, I will have lots of time to devote to blogging and getting caught up. In the meantime, let me know what you are up to with your own reading. What are you in the middle of? What did you just finish? (I will live vicariously through you until I can actually write a post). Since posting about my Shakespeare Reading Month on Tuesday, I have had a few people requesting my reading pile! While nothing is set in stone, I am planning on reading some of the plays on my list that I haven't gotten to just yet, as well as his sonnets. I may even pick up a biography. However, my main goal are the plays, so here are the titles I haven't gotten to just yet! For those of you participating, have you thought about which plays you are going to read? Anyone have thoughts on any of these? December 2011 Group Reads: Sense and Sensibility and Paradiso. I figured it was about time to announce the two reads for December Group Reads. I have really enjoyed the new format-less constricting than a readalong-but it is still up in the air at this point whether I will continue to host in the future as a regular feature. I love hosting, but a very (selfish) small part of me just wants to read whatever I want in the new year AND participate in other events. :) We'll see. I can't resist community aspects of blogging! 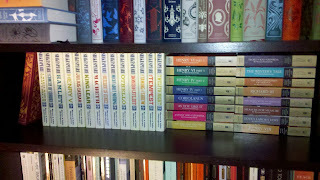 I ended 2010 with an Austen title (Emma), and haven't read any other Austen in 2011. I adore her, so it seems like I should create a yearly tradition of reading her around the holidays. There is nothing like Austen to put a smile on my face. Sense and Sensibility is the Austen title I know the least. I have only read it once, and it was so long ago that I have a hard time remembering details. And Jillian has been raving about it since she finished it, so I feel like I finally need to pull my copy off the shelf, dust it off, and read it. I will put a master post up on the 22nd, and you will have until the end of the month to link your post there. Once you have your post up, come back and check in on other participants to see their thoughts and reactions! 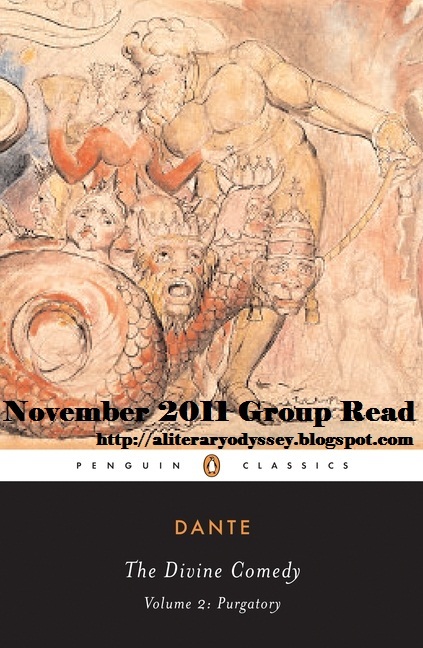 The second Group Read for December is the third and final volume of Dante's The Divine Comedy. I'm not sure who is still hanging in there with me in this three-month read of the three titles, but I hope you'll consider joining in, especially if you've only read Inferno! In this third and final volume, Dante will travel to Paradise, meet those who have found their way there, and end his travels through dominions not on earth. I am excited and happy to be reaching the final volume. I am also excited about being able to cross off The Divine Comedy on my list. :) Like the Austen, a master post will go up on the 22nd. You'll have until the end of the month to link your thoughts there! Thank you all for participating in my various readalongs and group reads this year! I had a blast, and I hope you did too! You know, I probably shouldn't be signing up for challenges when I am most likely only going to succeed at 1 out of the 3 I signed up for this year. But it is challenge season and I get all excited about making lists. However, there are three that have been circulating around the blogs that I can't escape from. All are "classics" challenges. Usually, I stay away from them because I almost feel like I'm cheating. 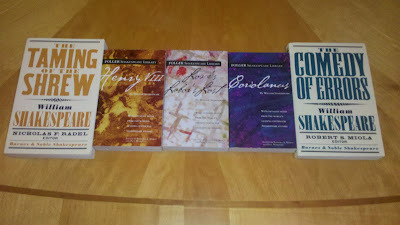 BUT, I will be using them to read some titles I have been putting off. Plus, they seem like fun. How can I NOT join in? For my own sake, and to give myself a bit of a challenge, I am going to try not to "double-dip" any of my selections for challenges. Meaning, if I can help it, all classics-themed challenges will have different titles. Unless I lose my mind. And decide I need to do that. Then I will. 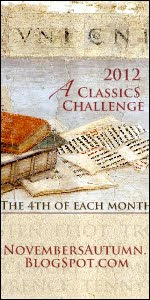 The Back to the Classics Challenge is hosted by Sarah at Sarah Reads Too Much. I linked directly to the sign-up if you are interested. 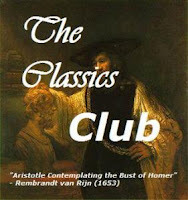 The goal of the challenge is to read 9 classics in 9 categories. Half the fun of this one is deciding what to read to fit each category! The second challenge I am joining in on was created by Katherine over at November's Autumn (again, I linked directly to the sign-up post). "I've organized this challenge to work a little like a blog hop. I hope this will make it more interactive and enjoyable for everyone. Instead of writing a review as you finish each book (of course, you can do that too), visit November's Autumn on the 4th of each month from January 2012 - December 2012. You will find a prompt, it will be general enough that no matter which Classic you're reading or how far into it, you will be able to answer. There will be a form for everyone to link to their post. I encourage everyone to read what other participants have posted." Bless Me, Ultima by Rudolfo Anaya: I continually give this one the eye when I stare at my bookshelves (who doesn't stare at their shelves, anyone? ), so I think it is time to give this one a read. The Fall by Albert Camus: My first Camus was a complete failure (The Stranger), so I need to try again. Moll Flanders by Daniel Defoe: I really liked Robinson Crusoe, so we'll have to see how this one measures up! The Beautiful and Damned by F. Scott Fitzgerald: I have mad love for Gatsby, which is probably why I have avoided all his other work. No more! Enemy of the People by Henrick Ibsen: I don't know much about this one, except that it is a play, but it should be a good read!. Cyrano de Bergerac by Edmond Rostand: Another title I know nothing about, so I am looking forward to it! 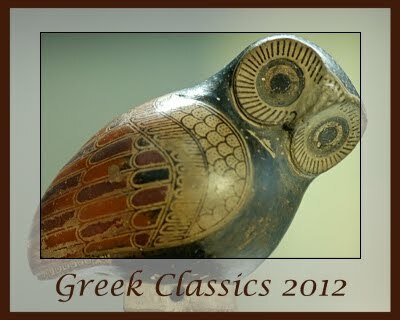 The third challenge I am officially joining is the Greek Classics Challenge hosted by Howling Frog Books (Link will take you to the sign-up post). This challenge has levels, going from 1-4 titles, all the way up to 11+! While I am definitely behind on my Ancient texts for my project list, I think it might be best to stick with a lower number (hey, I'll be excited if I get one more read!). The lowest level is Sophocles with 1-4 books being read. There you have it, the first three challenges I am joining in for 2012. To be quite honest, the only other challenges I am going to consider is a Victorian Lit challenge (since that is the only one I am ROCKING this year) and a potential TBR Challenge. Unless something is really tempting, I need to limit myself. Let me know if you are participating in any of these as well! This has been an elusive title for me. When I originally made my list back in the August of 2009, this book was removed and added back in a couple of times. I was concerned that it was a "modern classic," but because it had such wonderful reviews and acclaim, I left it on. And then I couldn't find it. Every time I went to a bookstore, there were certain books I always looked for, and this was one of them. It was never there and when I asked about it, no one had heard of it. But, in the midst of all the closing Borders stores over the summer, I found a lone copy mis-shelved. I bought it and gave it a home (and of course, now I see it everywhere I go). The question is...was it worth the wait? And from the first part of this novel, 113 pages in to a 483 page chunker, I say yes. Yes, yes, yes. The subtitle of the book is "A Novel of Love and War," and while I am certainly looking forward to the war aspects, the romance and love Faulks builds in the opening section warmed my heart. The novel opens by introducing us to Stephen Wraysford, an Englishman who is in France on business in the year 1910. While observing the production methods in a mill, Stephen finds a home with the Azaires, a well-to-do family. It is here that Stephen falls for the beautiful Isabelle Azaire, wife of the man Stephen is staying with. Faulks does a masterful job if building their romance slowly. It bubbles beneath Stephen's consciousness for a bit before it hits him. While he may be young and foreign, Isabelle cannot help but to be attracted the strength of Stephen's passion. They begin a love affair full of passion and strength. They doubt each other and the strength of their emotions, but the scenes with just the two of them alone are simply beautiful. There was the sounds of doves in the garden. He felt his heart beat against her shoulder. The smell of roses came faintly from her scented neck. He settled his hand in the curve of her ribs. His nerves were stilled in the sensuous repletion of the moment that precluded thought. He closed his eyes. He slept, at peace" (73-74). What I also love about this opening, is that I know that pain and struggle are coming. After all, this is a novel of love AND war, so I know that Stephen will find himself in the trenches, battling for his life. And will it be Isabelle who pulls him through? Because really, that is the question Faulks leaves his reader with at the end of Part 1. In the last few snippets of chapters, Stephen and Isabelle out themselves to her family. In the dark of night, they leave the house in disgrace. They find themselves in a new place, living as husband and wife. But when Isabelle learns she is pregnant, she leaves him behind. Stephen is left with nothing but the hope she might return. But since the next section starts in 1916 on the front lines in France, who knows what has happened between. "But now, something else, his distance, made it all right to study his face, to see for the first time the black dots on his temples and the bridge of his nose, the ear lobes which sagged on either side of his head, and the bristles which grew on the edges of his jaw.... But it was his eyes, narrow beneath the loose skin of his lids, deep behind his cheekbones, which made one realize the old man's distance was permanent. It was behind those misty white eyes that gave off no light that he lives, a world as clean as the rustling willows, the bark of a fox or the odor of musk during mating season." I have never heard of Welch before. And looking him up online, I have never heard of any of this other novels. Perhaps this shows my ignorance, but I was also insanely curious about his lone novel on my list. I had the hardest time finding a copy at a bookstore, so I caved and ordered it a couple months ago. Its slim spine was the perfect indicator for a Readathon book, so I picked it up as the last title I read from cover to cover on October 22nd. I liked it. But I didn't love it. And while I marked passages, like the one above, for their beauty and simplicity, I also felt like I was missing the larger purpose and meaning. And then it finally clicked after I thought about it for hours. Winter in the Blood has a lot of similarities to Ceremony by Leslie Marmon Silko, which I read over the summer. Both are set in the wild and untamed west. Both have the mystery and aura of Native American culture. And both are about young men lost and searching for meaning and their identities. In Ceremony, Silko gives her writing completely over to the depths and emotions that she recognizes as being central to understanding the complexities of her character's life. Welch, on the other hand, seems to hold back. And I know I shouldn't compare the two, but I have to. What I did like in Winter in the Blood, was the way that Welch told his story. He unveils a piece at a time. Sometimes those pieces make sense. Sometimes they don't. Sometimes it seems as if he is introducing something just to toy with his reader. But by the end, and the ultimate epiphany, his character discovers the connection between new and old, being an American and savoring his culture. But for me, while I could appreciate the skill with which Welch wrote this story...well, I felt that another writer did it better. And she did it in a way that any story even remotely similar will come second to hers. And while I can wish I had more to say, I don't. How's that for a review? I had decided all the way back in August that I would attempt to read a number of Shakespearean plays for the October 22nd Readathon. By the time the day came around, I was a little grumpy, so I only read one. But what a play it was! This was only the second time I have read Julius Caesar. The other time was in college for a project (we had to create a wiki with assignments on it for the play-and I feel I should tell you I just spent 10 minutes searching for the wiki but it appears to have been taken down. Bummer). I was partners with this guy named Frank and he is the one who picked the play. It was his "FAVORITE" so we had to do it. I obviously had to read it before I could make lessons for it, so I read it over a long weekend and I kind of loved it. 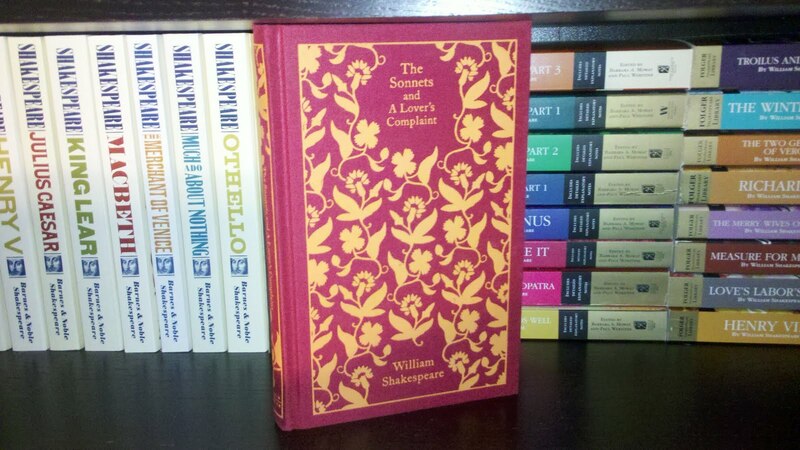 I wish, that instead of the whiny Hamlet that we read when I was a senior in high school, we would have read this one! Julius Caesar is about the plot to kill and overthrow the great Caesar. The play opens with a sense of slight mystery. There are plots among many of the statesmen, who all come to a consensus that Caesar is power-hungry and will destroy what they have built. They come to this conclusion based on what they want to see...so it all seems ridiculous. This crazy old coot attempts to warn Caesar of what may come, but it seems Caesar doesn't care. After all, he continues to meet with those closest to him, not seeing that they may be in on the plot. The first time I read this, I was surprised by how quickly the assassination of Caesar comes. I thought it would be near the end of the play-you know, a good, dramatic bloody end. 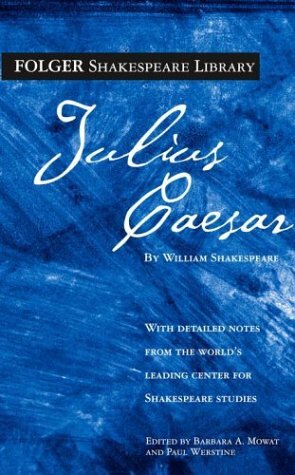 I was surprised to find that the murder and assassination of Caesar actually happens in Act 3 scene 1, only halfway through. (translates to "And you, Brutus?"). That line got to me the first time, and it did this second time around as well. There is something about a big manly man like Caesar being betrayed by a friend that bothers me. It goes to show you that while you may think a friend has your back, they may be plotting to stab you in it (that was my attempt at a bad joke. sorry). The last two acts detail what happens to the nasty conspirators after they leave Rome, and I don't want to give away what happens for anyone who doesn't know. 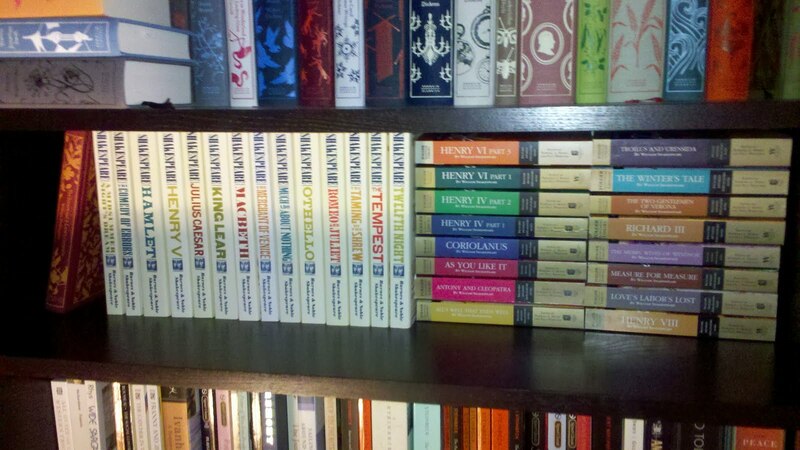 But the end is good, and sets up Antony for Shakespeare's Antony and Cleopatra (which I haven't read just yet. Maybe it will be next). 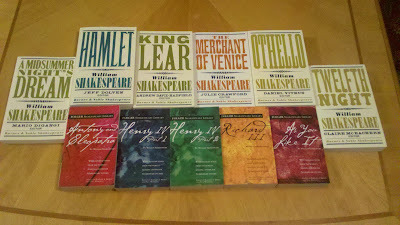 What I love most about reading Shakespeare is what I pull from it on each reread. And while I know Shakespeare is best when seen live, there is something about diving headfirst into the language that I really love. He was a master! And while I think I am getting pretty good at pulling meaning and making my own interpretation of his words and phrases, it helps to have a good edition. 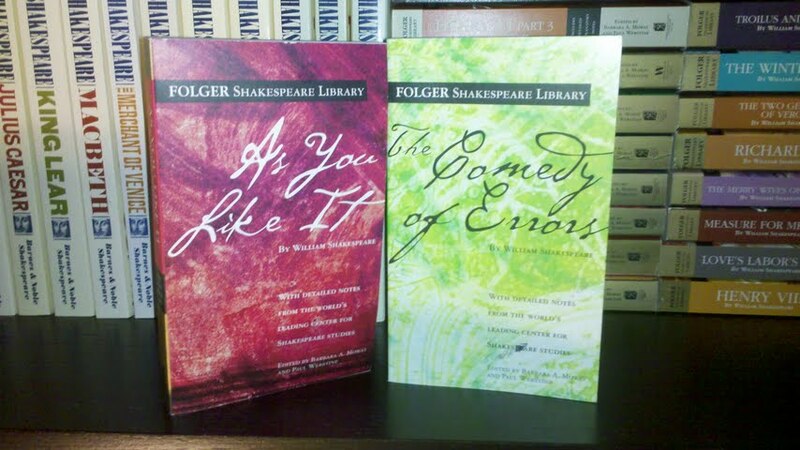 I have two sets of editions that I read from-either Folger's or the Barnes and Noble Shakespeare series. I really like both, and both have their upsides and downsides. 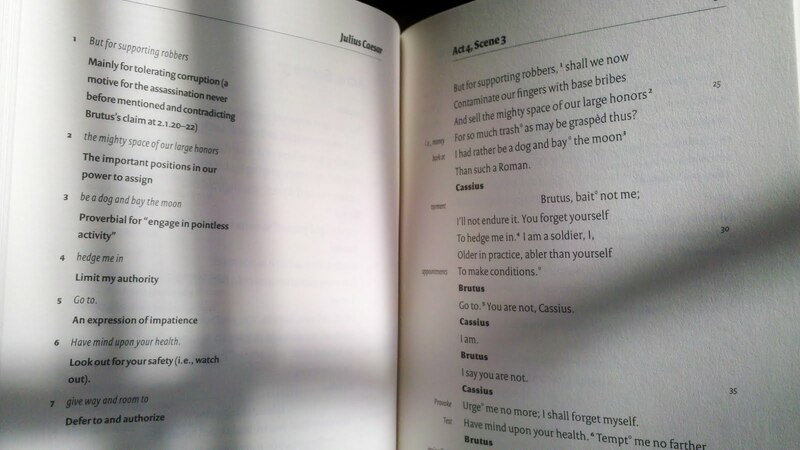 The image of the open book shows the inside of my Barnes and Noble edition of Julius Caesar. It is a well-done edition. I love that the right page is the play, and the left side contains corresponding notes. It makes references easier to follow and the explanations aren't dumbed down. 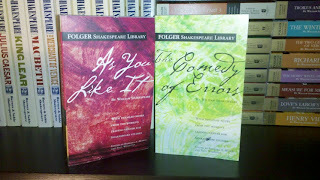 The Folger's editions are similar. 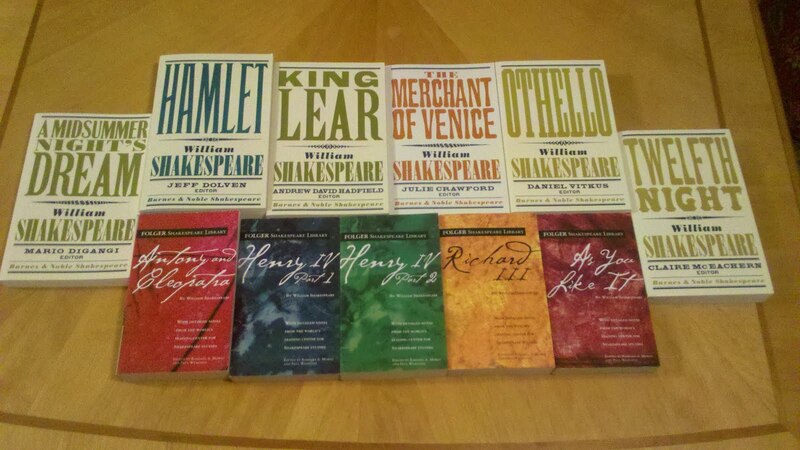 As I continue to read more of Shakespeare's works, I find myself looking less and less at that left page. 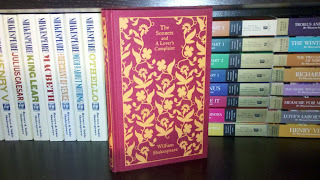 Perhaps that has to do with my comfort level, or I just think I know more than I do... ;) But really, I feel very comfortable with the Bard, and he has become a bit of a comfort read for me, if I dare to say that. Anyway, I leave you with this. Julius Caesar is really a marvelous play-with a great deal of plotting, intrigue, scandal, and action. I am sure that if I ever have the opportunity to see it live, I will. But you should also give it a try sometime! I leave you now with three things. 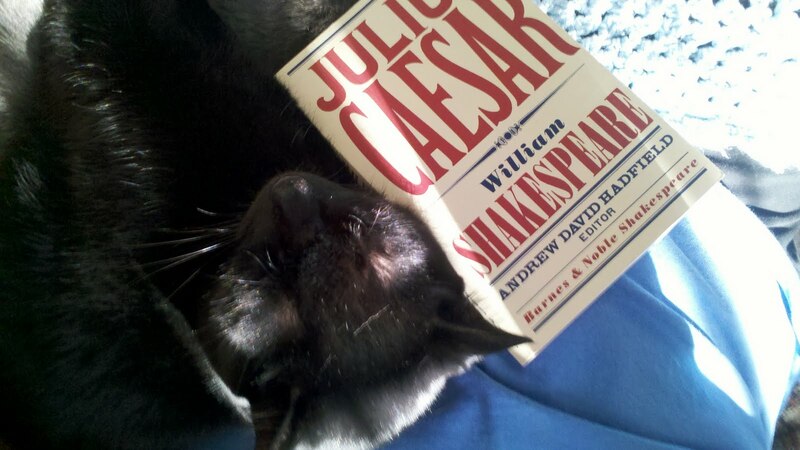 First, the knowledge that I am hosting a month-long Shakespeare event (details to come) in January-so you should read this then, a picture of one of my kitties cuddling with my copy of the play, and a last few lines. "Abandon every hope, all you who enter," (89). I'm not sure what I was expecting when I began reading Dante's Inferno. Maybe I thought I would get a lot of religious doctrine shoved at me. Maybe I thought that it would be a pleasant description of the place I really don't want to end up in...or maybe I expected something completely different. Inferno is essentially about Dante (the character, not the writer) and his trip through hell. The rest of The Divine Comedy (which I am reading in November and December) will take us through purgatory and paradise. But this one seems to more widely read than the other two...perhaps because it is so disturbing? Yeah, I'll go with that. 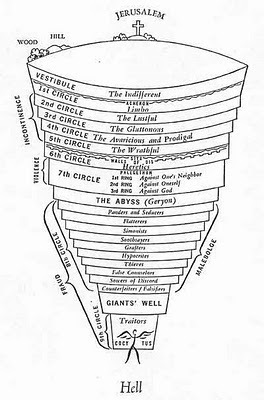 Dante, the character not the writer, explains to us as he descends the levels of hell and what it means to be closer to the bottom (or the smaller rings-however you want to picture it). Those souls near the top and wider rings are sinners who committed lesser sins. Those in limbo are those who never found God in their earthly lives. As you move down, or further into the rings, you find sinners with worse crimes and punishments. What was most interesting was the perspective on where Dante placed certain sins on terms of this scale. Those near the very center, closest to Satan, were those sinners who seemed to really go with their free will. As I understand it, Dante explains that God gave humanity free will. To violate that will and violate the trust God placed in you as a human being means that you find yourself in a far worse predicament than if you committed a crime of passion (like those in the lust circle, close to the top (outside). I could be interpreting that completely wrong, but that is what I saw. One thing I should mention to those of you who haven't read this is to read the notes. In my edition, translated by Mark Musa, there are extensive notes after each of the cantos. These were amazing. Because while Dante meets people you recognize, there are also a lot of smaller references that will pass you by. Some of those include some of Dante's political enemies and figures I have never heard of, so yes, read the notes. Now that I am finished walking through hell with Dante and Virgil, I am heading to Purgatory. I hope that you'll decide to join in, even if you didn't join for this group read! (we'll be reading Paradiso in December as well). Weekly Wrap-up for November 6, 2011: Bits and Pieces. It dawned on me Friday that I only have ten more school days until I am done with my placement. The kids won't be in this week until Wednesday, so I will only see them three days. Then there is a full week after, followed by a measly two days before the Thanksgiving holiday. I'm not sure what the plan is for after that. This is the first time in a year and a half that I haven't had something full-time and steady lined up between the park and teaching. I suppose daily subbing will have to do until I find something else. I will certainly miss my kids. I may have mentioned, but we finally hit our comfort level a couple of weeks ago. They finally got into the groove of school, things have been flowing...now things will be turned upside down when they get a new teacher for the remaining 8 weeks of the first semester. Ah well, that's how it works, I suppose. Anyway, besides the teaching aspect, I had some miserable mornings this week. I think I woke up with a nasty headache/migraine 5 days this week. Blegh. Today was by far the worst, but not it is just a dull throbbing, so at least I can function. I did miss out on a family party, due to the nausea aspect of the nastiness. Bummer. I have been neglecting the blog. And I know I am. What, I had one or two posts last week? Not good. I have taken to handwriting thoughts and impressions while I read, but coming on to type up posts, read blogs, and comment just hasn't happened. Since tomorrow is just a PD day and Tuesday is off for elections, I am planning on getting caught up here, at least so I have no more posts to write and are lingering over my head. I think school just had to take priority for awhile and since it is coming to a close, I am sure my main focus will transition over here once I am only daily subbing. My reading did pick up a bit this week. 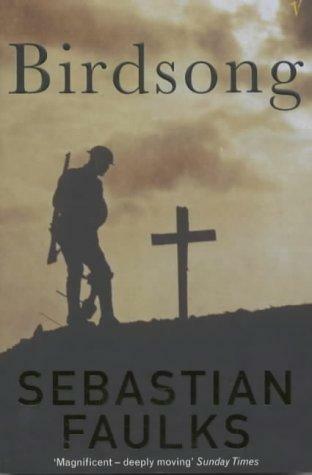 I read the marvelous Birdsong by Sebastian Faulks. It was one of the "modern classics" on my list, and I find it wholly deserving of that classification. It was moving and a little gruesome. But I really did love it. The new problem is deciding what to read next! Any suggestions? I am also working on some ideas for events for the new year. 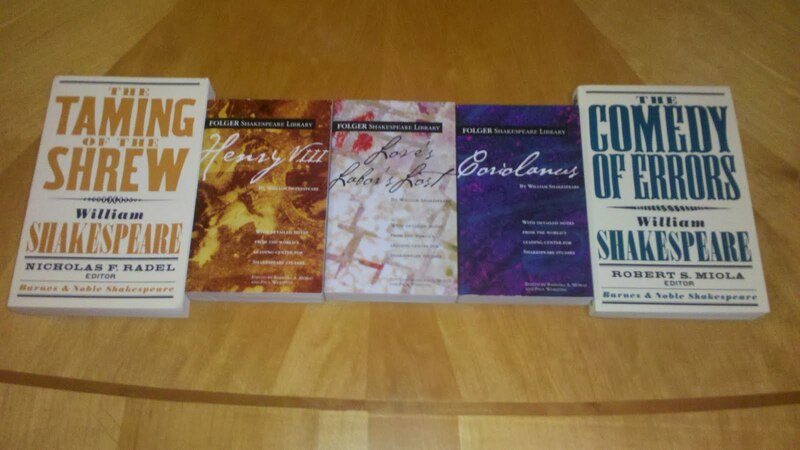 I am planning on a Shakespeare themed month in January, and some Faustian works in February. Once all the details are hammered out, I'll let you all know. On that same note, I don't know the future status of readalongs or Group reads in the new year. While I really like them, and while the new format is working, I don't think I am going to plan them out like I attempted to this year. I only made it about 6 months before having a meltdown. Perhaps I will host as the mood strikes, but I am getting to the point in this project where I need to make some progress. I'm not even to the halfway point and I have been doing this for over two years. The original plan was to finish in three, and that is so not happening. Anyway, I'm thinking about things for the new year and what I want this to be, so any feedback or advice is welcomed. In Nano news, I decided to jump in rather late. I wasn't sure if I was going to participate this year, but had an idea and I'm running with it. I broke 10,000 words last night, so I am on pace. I may do some more writing later if the headache disappears. I'm feeling a little weird about my novel, since my writing is much more personal than it ever has been, and I am writing in a genre I haven't written in before. I have a lot of nerves about what this story will turn into. But for now, the writing is flowing and I feel like it will be something to be proud of. I hope you all have a great week. Read wonderful books! I know that most of you have heard about National Novel Writing Month, but for those of you who haven't, NaNoWriMo is a month where crazy participants aim to hit 50,000 words of a novel in 30 days. It is a blast and I have done it for many, many years. I was going to take a break and not do it this year...but then I got a blast of an idea and starting writing last night. Almost 5,000 words later...and yeah. You get the idea. If you are participating, my name on the site is aliteraryodyssey. I used to have another log-in, but I changed it over last year.